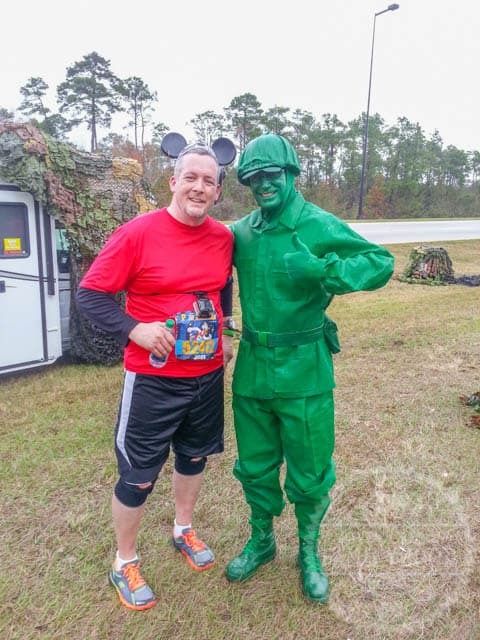 In 2014, we went to Walt Disney World for our very first runDisney race weekend. 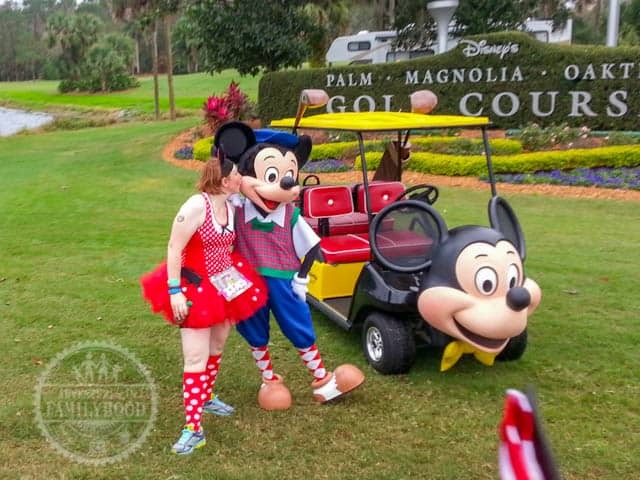 We had signed the kids up for the kids races, Lisa for the 5k, and myself for the WDW Half Marathon. 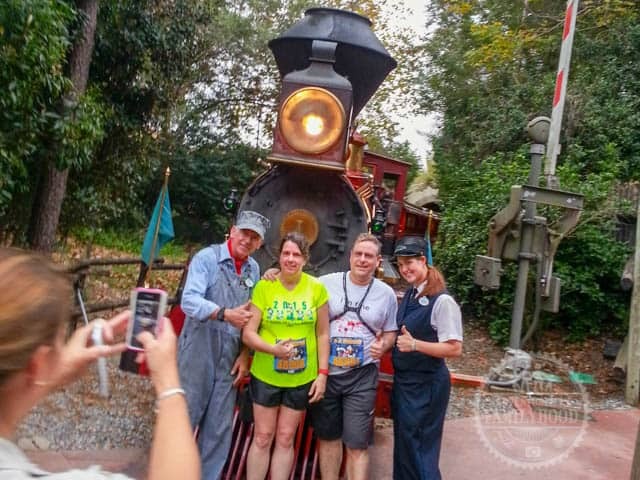 We consider ourselves seasoned veterans of Walt Disney World vacations, but we were nervous about our first runDisney experience. It didn’t help that my training had been derailed by not one, but two knee surgeries (same knee) leading up to the trip. 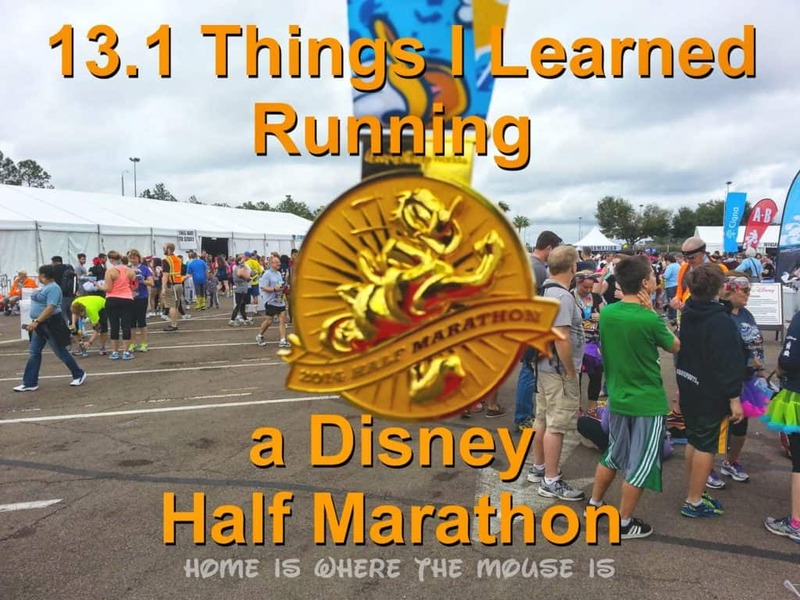 Here are 13.1 things (one for every mile) that I learned running my first runDisney Half Marathon. 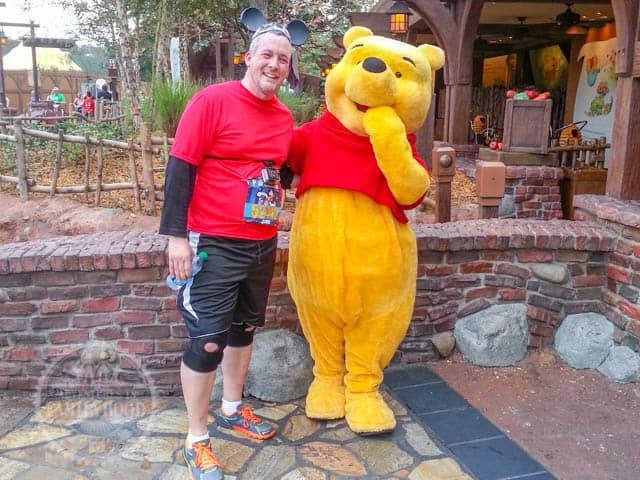 I originally set my sights on the full marathon, but injured my knee right at the finish of my very first 5k in the early spring. As a result, I decided to register for the half marathon instead. When I was cleared to start running again in the summer, I immediately noticed pain and swelling in the same knee that was just repaired. Ugh! I ended up having a second surgery on that knee in October, which prevented me from ever getting into a groove with my training program. I was only able to get about 6 weeks of training in before the race. My longest training run was only 8 miles. Still, I was determined to complete the course, even if it meant walking a good portion of it. I just needed to stay ahead of the sweepers. 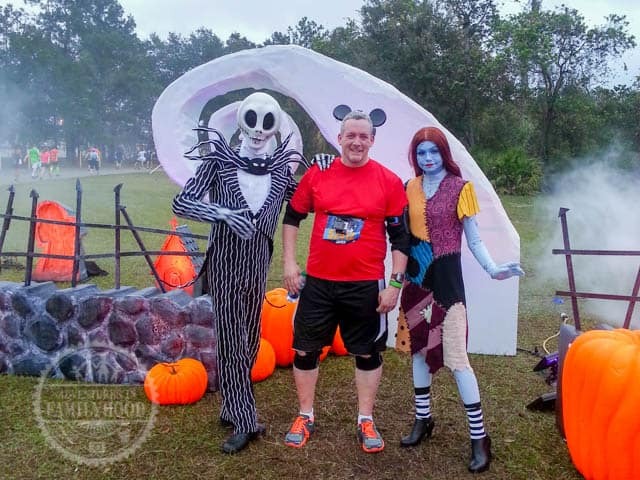 Here’s what I learned about running, about runDisney, and about myself on that day… in the order I learned those things as I was running. If you’re not careful, your legs could be tired out before you hit that first official mile. After all, you’re at Disney and the thought of doing the parks (and all the walking that goes along with it) is hard to pass up. I’m not saying you can’t do the parks, but you should try to take it easy. 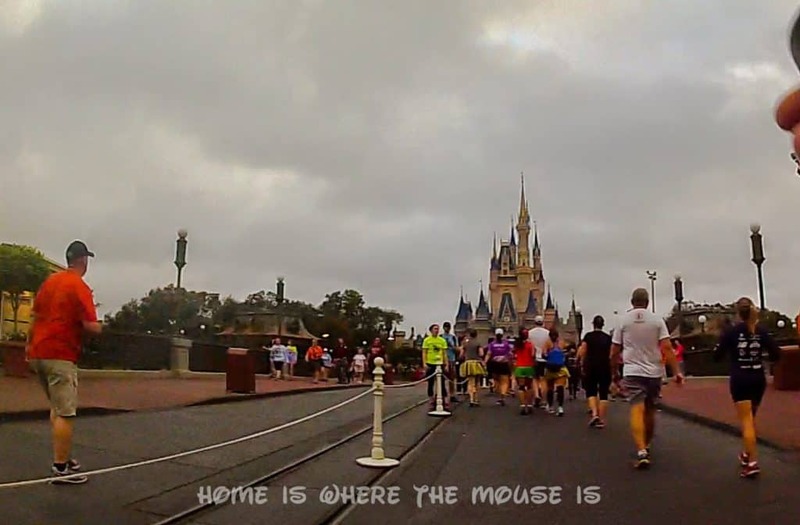 The night before I ran the Half, we closed down Magic Kingdom and I only got a couple of hours of sleep. I was up at 3am or so to head over to the staging area. We didn’t want to take a chance on any problems causing us to be late for the race. Nobody said anything about the walk from the staging area to the corrals, and then the walk from the corral to the starting line. I think we put in almost 2 miles of walking before ever starting the race! Depending on your corral placement, you may then be waiting a while longer before starting. I arrived nice and early and was in the very last corral, which meant I had a long wait. Thankfully, I had fellow DisDad Travis to keep me company. But it’s also a good idea to bring extra water and use this time to hydrate and stretch. A fifteen-minute power nap might have been good, too. But I was too nervous to even try that. You may notice I’m wearing a GoPro across my chest. This wasn’t the best placement and the footage ended up being so shaky it was unwatchable. Each corral gets started with its own music, countdown and fireworks! It really gets you pumped up and it’s only natural to want to start off strong. It seemed like forever until it was our turn to start. I crossed the starting line, remembering to start my Garmin watch, and we were off! I think I was about a minute ahead of the “balloon ladies” who mark the minimum 16-minute pace. Before I knew it, I had already run a mile. I was caught up in the excitement. I paused to get a picture of the mile marker and kept running. total time running: 11:50 Time stopped: 30 seconds. +4:30 ahead of minimum pace. Travis and I had different strategies. I told him I’d see him at the finish, and pulled away. I was trying to identify people I could run with. I was trying to find a pack, but I kept feeling like everyone was going too slow or too fast. I wasn’t concentrating on my own pace and the humidity already taking a toll on me. Running in Florida is so different than running in New York. I started to regret not having a plan. I figured that I would run as far as I could, then start using a run/walk to get me the rest of the way, resorting to walking if it came down to it. I was just playing it by ear at this point. Having a strategy might have helped me conserve energy early on. I saw a giant pirate ship in the median as we got on to World Drive, so I made my way over to the left side of the road so I could see it better. The 2nd mile marker was on the far side of the road from me as I passed it. It’s hard to see in the photo, but it featured Flynn, Rapunzel, and Maximus from “Tangled”. total time running: 12:26 Time stopped: 00:04 +8:00 ahead of minimum pace. It’s hard to stick with a plan when you don’t really have one. That pirate ship was the first character spot on the course. I decided to stop even though there was somewhat of a line. When would I have an opportunity for a photo op like this, again? Plus, the stop gave me a bit of a breather. I had built up an 8-minute lead over the minimum pace, so I had earned it. My plan became to run as much as I could AND get all the character pictures there were to get. The fact that getting character pictures became my top priority shows that my focus wasn’t on my running, my pace, or finishing the race. 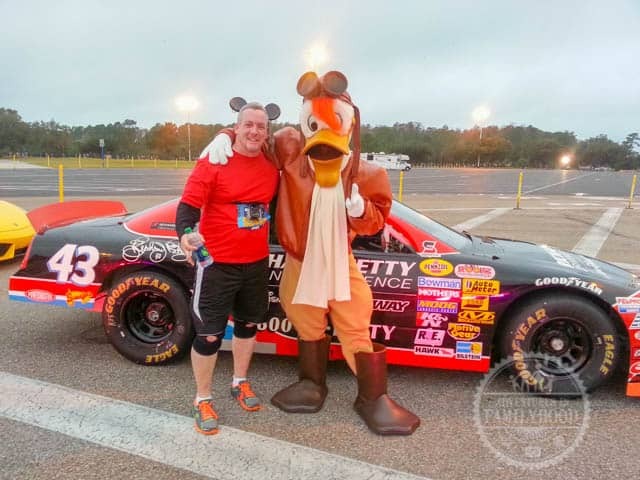 For right now, it was all about the “Disney” part of the race. The excitement was building now that there were visible signs that I was getting closer to Magic Kingdom. It was also getting light out. Capt. 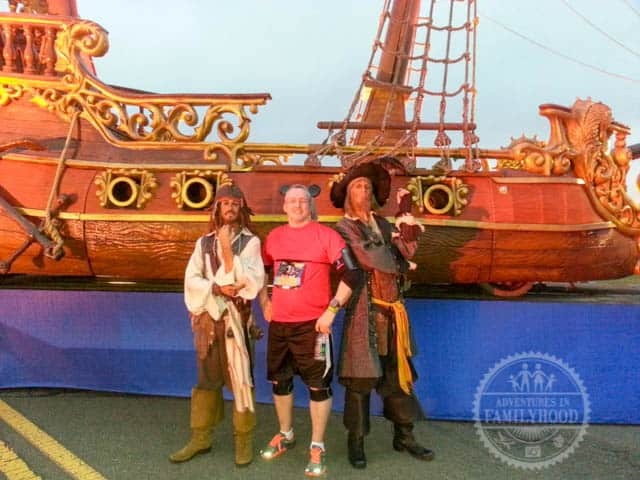 Jack Sparrow and the parking lot booths were just a taste of what was to come! I was still feeling good at this point. Mile 4 brought more rare characters and I couldn’t pass them up. Thankfully the lines weren’t too long. All of my training runs before this had been just me and the road. More often than not, I’d run late at night and would hardly see anyone else. Now, here I was running with people on all sides of me, all the time. By the 4th mile, the crowd had spread out a bit, but there were still A LOT of people and that made it difficult to navigate. I was starting to pick up a bit of the runners’ etiquette from what I assumed were some of the more experienced people on the course. Basically, it boils down to being mindful and considerate of each other. Do your best to stay in your “lane” and not stray side to side. Slower traffic should keep to the right, when possible. If you are run/walking, you can let runners behind you know you are about to slow down to a walk by putting your arms in the air. Passing someone? Try to let them know by saying “on your left” or “on your right”. A lot of runners wear ear buds, but all you can do is try to let them know you’re there. Oh, and throw your garbage off to the side of the road. Those water stations got very messy. One slip can end your race. It was also great to see spectators along the road. They may have been there to cheer on a specific person, but it felt like they were there for everyone. 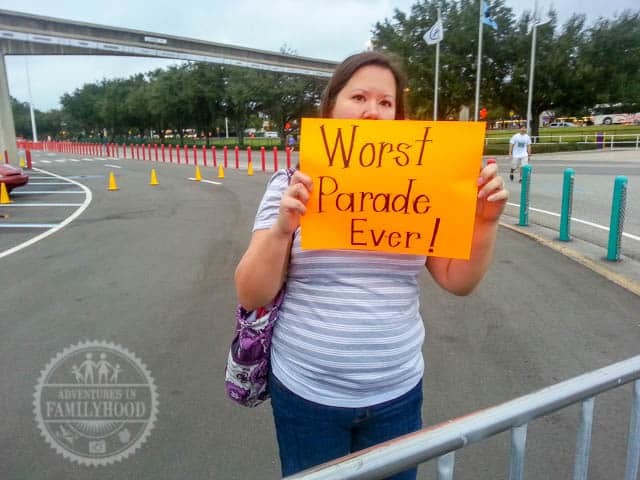 I saw one of my favorite signs as we crossed the Magic Kingdom Parking Lot. 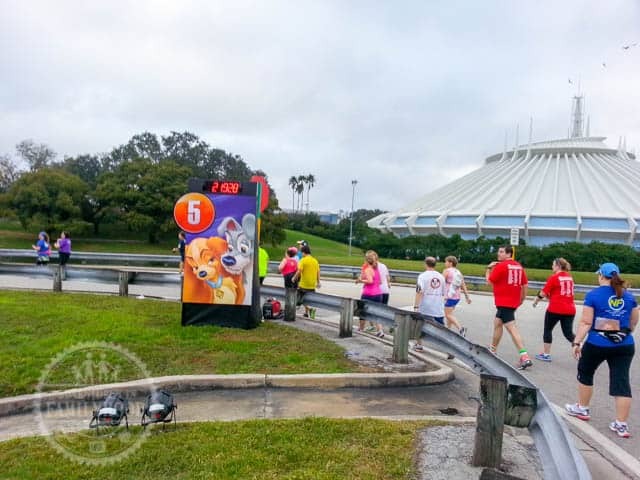 Mile 4 ended at the Transportation and Ticket Center. No monorail for me, though. The character stops over the last two miles had negated much of the breathing room I had built up, and I needed to pee. Mile 5: Hydrate, Hydrate, Hydrate! 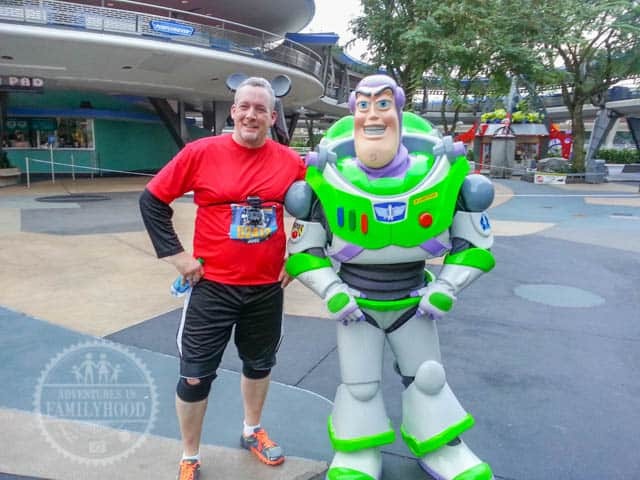 A lot of people will tell you that the number one tip for any runDisney race (or any race in general) is to hydrate. I had read and heard people say that as well, but it wasn’t until mile #5 that I realized how important that advice is. I had been drinking water the whole day before and that morning before the race. I was clearly dehydrated. You can tell if you are or not by the color of your urine. If it’s dark, you need to drink more water. It should be light to almost clear, like lemonade. Mine was um… orange. The only thing I could do was to start drinking more water. I finally understood why I saw runners running off to the side of the course to pee right after they crossed the starting line. They had been hydrating more than I was. That whole time we were waiting to start, I could have been doing the same. I also could have made hydrating part of my training and not left it for the last day or so before the race. 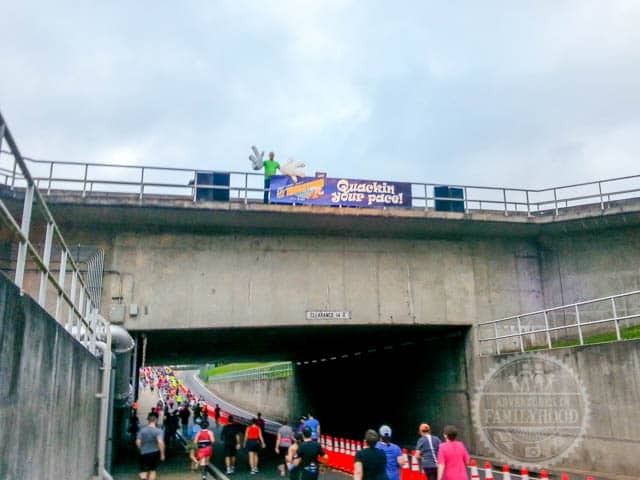 Speaking of water, the 5th mile of the course took us under the water bridge that connects Bay Lake with the Seven Seas Lagoon. For several seconds I was running under water… not that it helped the dehydration issue much. Coming out of from under the bridge is one of the few hills of the course. After that, a straight shot by the Contemporary Resort. 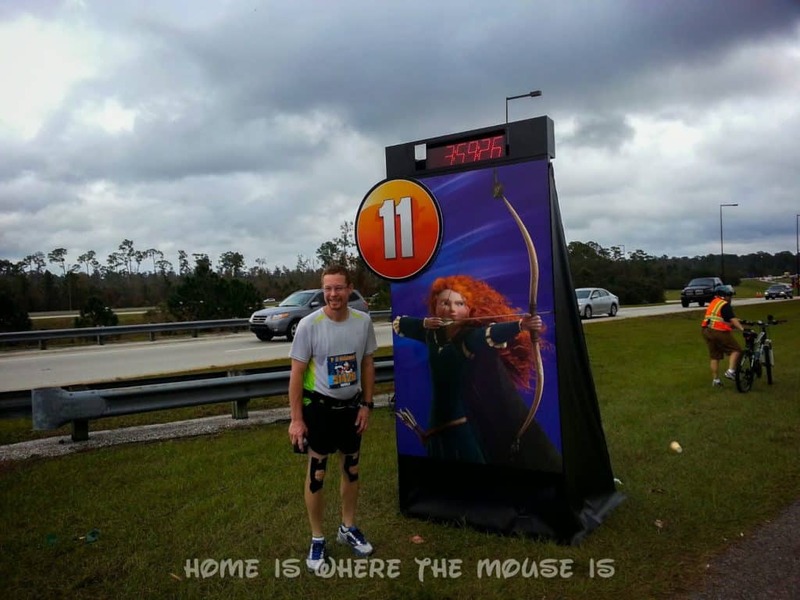 At mile marker #5 I was just outside the entrance to Magic Kingdom. and I had gained a little more time. total time running: 13:06 Time stopped: 01:23 +4:00 minutes ahead of minimum pace. 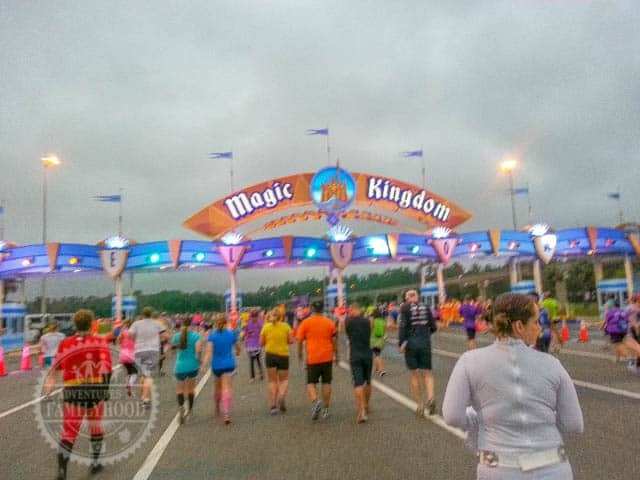 Mile 6: Magic Carries You… Only So Far! 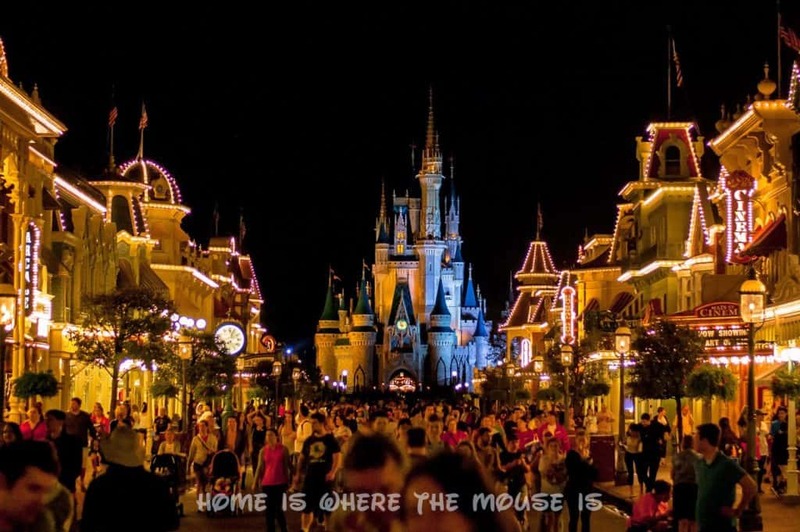 There’s nothing like entering Magic Kingdom and running up Main Street, U.S.A.. I was beginning to run out of steam, but entering the park gave me a burst of energy. I was running around a lot of people who were walking. In hind sight, maybe they were doing it right. They got to savor it more. I was too caught up in the excitement to slow down. Being in the park also meant more characters to stop for. I stopped for nearly every character photo they had and was having a lot of fun! Looking back, I think this is where I got into trouble. I didn’t notice it at the time because I was having too much fun. I also didn’t notice how tired I was, or how my injury-shortened training was affecting me. All the stopping had caused me to slip to the very back of the pack. It was right behind the castle getting a picture with Donald and Daisy that I was actually passed by the “balloon ladies” for the first time. I wouldn’t have even noticed if it wasn’t for people yelling that they were coming. I had to run to get back in front of the pace and had to start picking and choosing my spots to stop. I passed up a picture with Woody near Mile Marker 6 in Frontierland and kept moving. total time running: 14:28 Time stopped: 05:28 +0:00 ahead of minimum pace. My “plan” went out the window. I had missed a character, and now had nothing to shoot for other than finishing. Oh well, I was still having fun. My knee was holding up well. 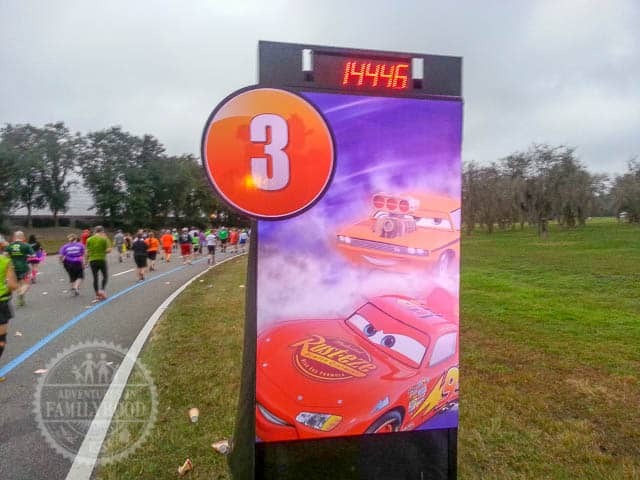 Up until this point in the race, we had run on roads, through parking lots, and through Magic Kingdom. Now it was time to go “backstage”. 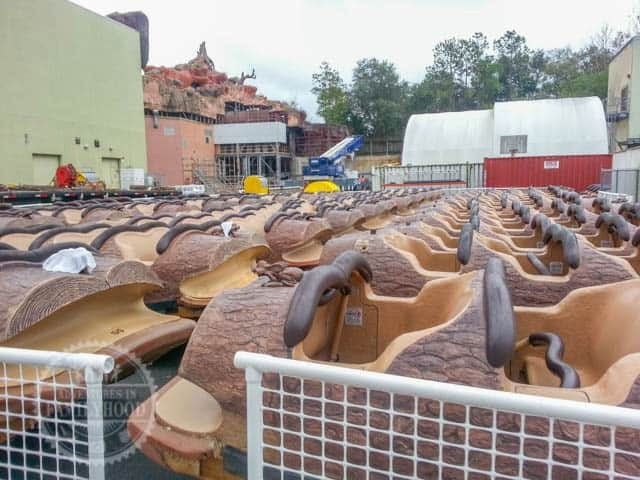 Like all the boats from Splash Mountain parked out back. This is where I also hit the 10k mark. Up until this point, my only official race had been a 5k, so this was an accomplishment. From there it was back out onto the road, and I was able to get in a picture with Filmore since there wasn’t a line. At mile marker 7, the “balloon ladies” were still right there with me. These ladies keep the unofficial minimum pace of the races. They are the last to cross the starting line and they maintain the 16:00 per mile pace required to be able to finish the race. For participants, they serve as a visible (and sometimes audible) reminder to keep up the pace to avoid getting swept. Sometimes, if they are going too fast, they’ll stop and wait at a marker like this one did as I was taking the picture. I didn’t even notice she was in until I looked at it later! I saw this shirt somewhere on the stretch leaving the Magic Kingdom. 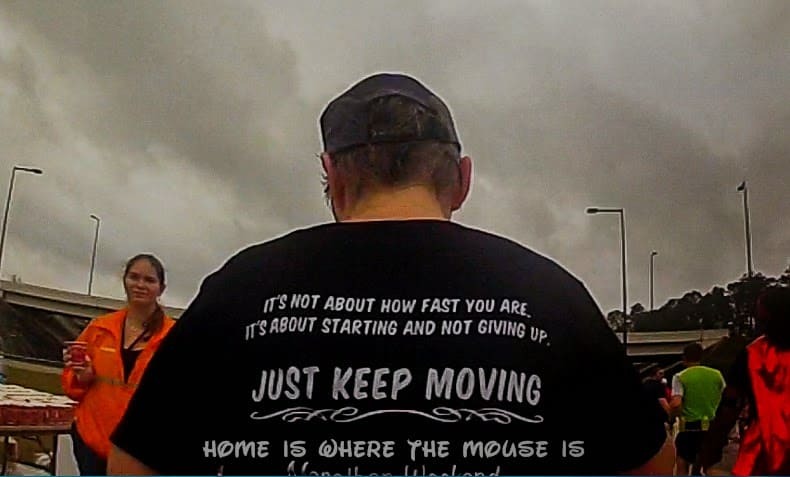 Just Keep Moving. I pressed on, not realizing the balloon ladies were on my heels again. I really thought I had managed to put some distance between me and them, but it’s amazing how that distance disappeared with every picture I stopped to take. I also got a picture with Lilo and Stitch, but the balloon ladies had actually passed me again, so I didn’t get one with my camera, just the marathon photographer. 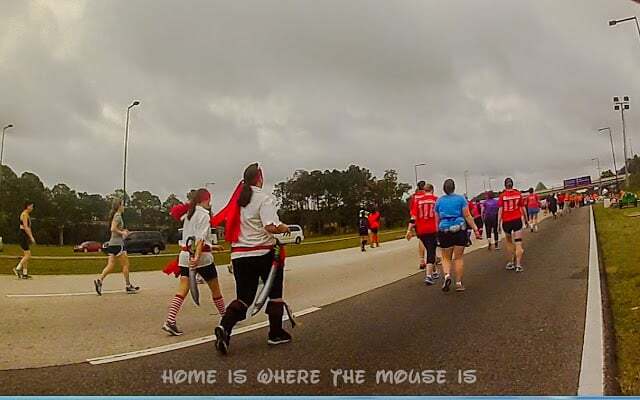 As I sprinted to catch up and get back on pace, I saw Mickey Mouse. The line was too long. I had to pass up one of the best pictures on the course. 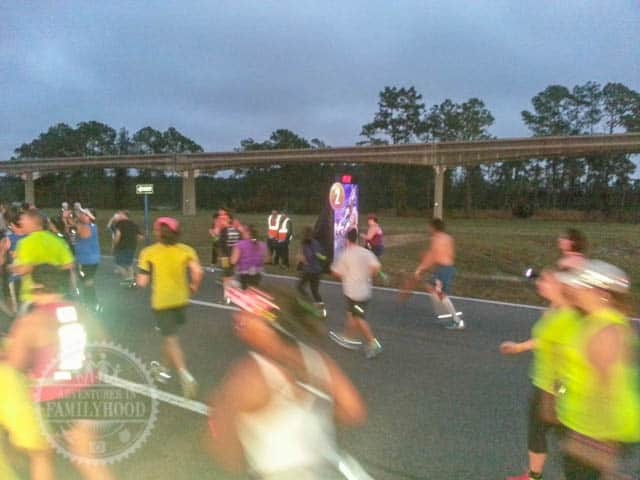 Shortly up the road next to the Polynesian at mile marker 8, buses were waiting to sweep up anyone behind the minimum pace. I just made it. To tell you the truth, I didn’t put it together that the buses and all the folks in the orange vests were gearing up to make the sweep. I just kept running. I imagine that they blocked the road and whoever hadn’t made it by had to board the buses. Then they drive them to the finish line. That’s what it means to get “swept”. I missed it by a matter of seconds, maybe a minute or so, at most. total time running: 14:04 Time stopped: 02:03 +0:00 ahead of minimum pace. 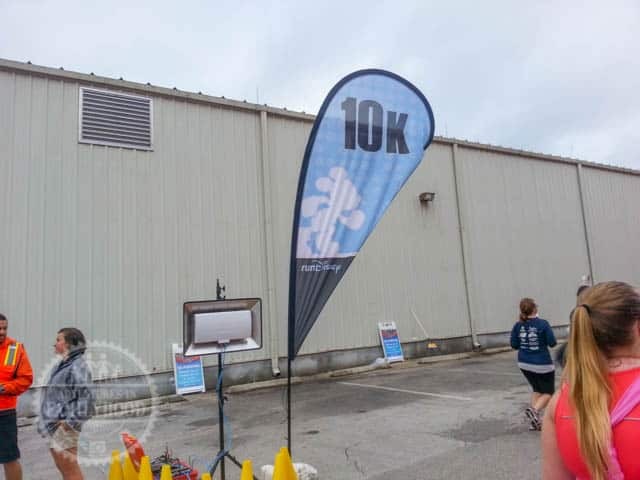 The 9th mile was the hardest stretch of the course for me. The Magic of running through the park was gone. There were no attractions and no characters. I found myself picking out road signs and willing myself to make it to each, before picking out the next. “Run to the billboard, then you can walk to the next sign,” I told myself again, and again, and again. For the first time since waiting for the race to start, I found myself paying attention to the other runners around me. The “runners” from our corral were long gone. I was with people of nearly all ages, shapes, and sizes. I was surrounded by grandparents and fellow dads and moms. Some were walking and having a blast. Some were obviously struggling. And we were all looking over our shoulders for the balloons. 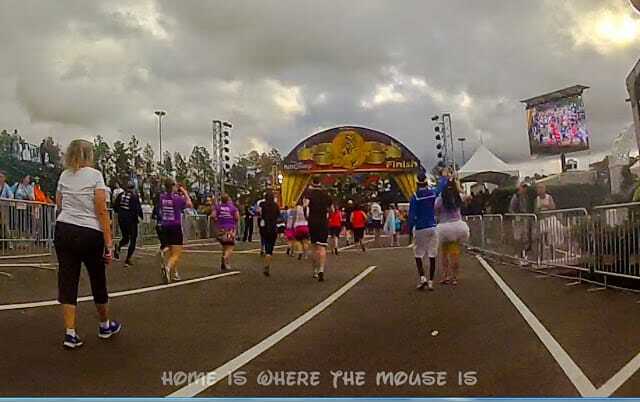 This was where I discovered the true Magic of runDisney. 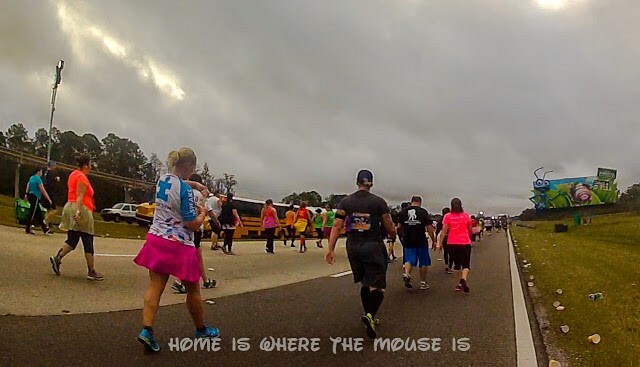 It’s the organizers, volunteers, spectators, and most of all the participants of runDisney races that make them Magical. It wasn’t about running, the characters, or the parks. During this stretch, all the extras had been stripped away. What was left was people pushing themselves to go the distance, urging each other on. What was left were volunteers and spectators standing on the side of the road to shout encouragement. Every last one of us was grateful for the support. It took me 9 miles to bury the competitive side of me who saw everyone else on the road as an “opponent”. I accepted the fact that all of us wanted the same thing. We just wanted to finish. In addition to the water and sports drink stations, They were also handing out energy bars and some sort of paste in a pouch that resembled something my children ate when they were toddlers. I had brought my own “energy chews”, but I grabbed some of the other stuff because I figured I could use all the energy I could get. I spit the energy bar out after one bite, the paste was harder to spit out, so I forced it down and chased it with water. The last thing you need when you’ve run about 10 miles is for something to make you feel nauseous. I’ll be sure to bring something I know I like and that I’ve used on training runs in the future. During the 10th mile, I hit the 15k mark. I had now run 3 times as far my only official race to date. 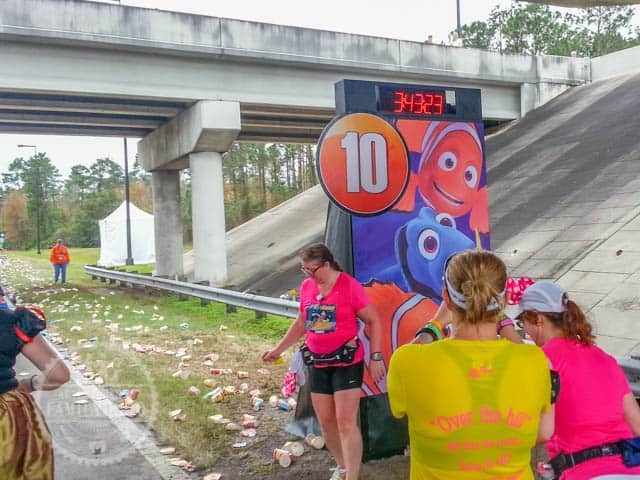 “Just Keep Swimming” was a fitting mantra to adopt at the 10 mile marker. I had put a little distance between me and the “balloon ladies”. I saw a bus near the exit to head back to Epcot. That may have been another sweep point. I know, that doesn’t make any sense. 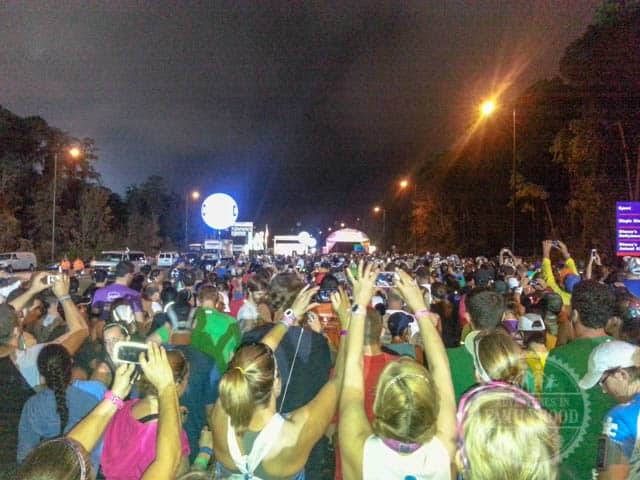 Running 13.1 miles should be harder than walking that same distance, right? Yes… but also no. Running is certainly more intense, but in terms of the work involved and the calories you burn, the harder work of running is offset by the the fact that you spend less time doing it. Walking may be less intense and burn less calories over the same distance, but you’re doing it a lot longer. By this point in the race, many people had finished. I was walking more than running now. We had been out on the course for about 3 hours. The temperature was on the rise and humidity was continuing to take its toll. I have a lot of respect for the walkers and run/walkers on the course. 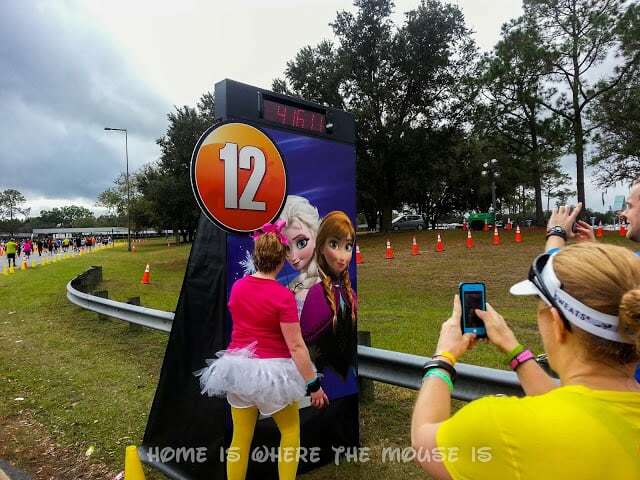 At Mile 11, we could see Epcot and the finish line on the horizon. We just had to get there. total time running: 15:01 Time stopped: 00:47 +1:30 ahead of minimum pace. On the 12th mile I couldn’t believe my eyes. We were out of danger from being swept, but I was still trying to run as much as I could. 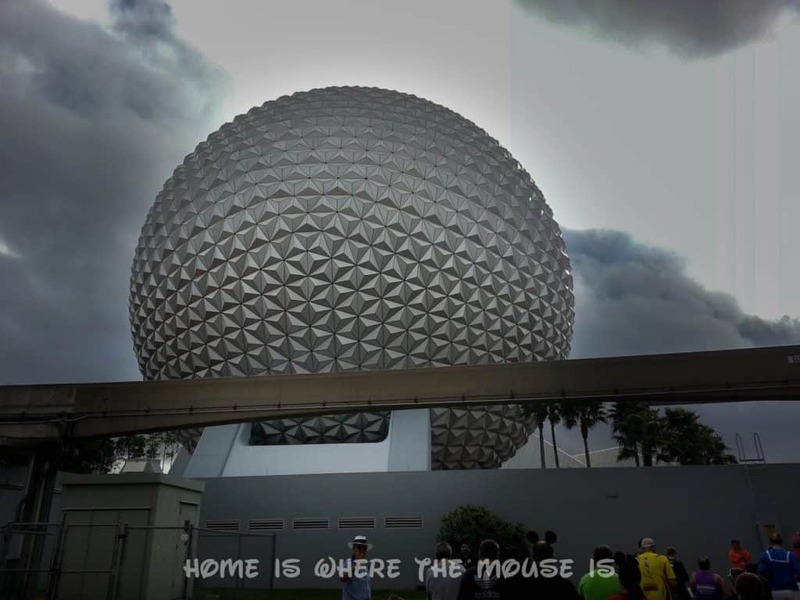 Spaceship Earth, large as it is, wasn’t large enough yet. As we approached the final water station, I caught up to fellow DisDad Travis, who had started the race with me 12 miles ago. He hadn’t stopped as often as I did, and had passed me while I was getting one of my character pics. His leg was bothering him to the point where he could only walk, but he was still going. Mile 13: Take it All in. The last full mile of course took us into Epcot. 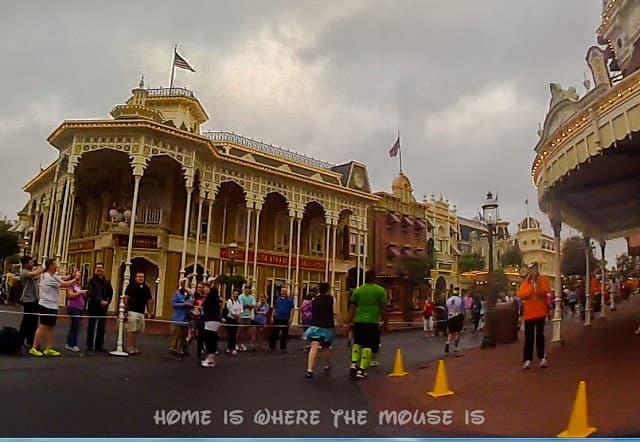 I again felt that Magic of running through a Disney Park. I tried to channel that energy and run some more. It was a little weird that by this time the park was open and guests were milling about, enjoying themselves and making their way toward attractions while we were going by. I passed the 20k mark. 4 times as far as that 5k months before. The finish line was so close now… but part of me didn’t want it to end, as crazy as that sounds. I stopped for that very last character pic at the World Showcase Plaza. Outside of Epcot and before the final stretch, we saw the famous Gospel choir off to the side. I’d heard a lot about them from recaps of previous races. I didn’t stop to get picture of the 13 mile marker. Finish Line Fever took hold and I ran toward the end. There are many times in our lives when we just feel like we can’t go any further or give any more than we have. That’s simply not true. Each one of us has it within himself/herself to dig down and find a little bit more. Perhaps some people are a little more adept at locating it than others. Don’t get me wrong, there are times when it’s wiser to not injure yourself or spend that extra energy in a losing cause. But if you really want it, it’s there. I ran that last tenth of a mile faster than any other part of the course, if you can believe that. 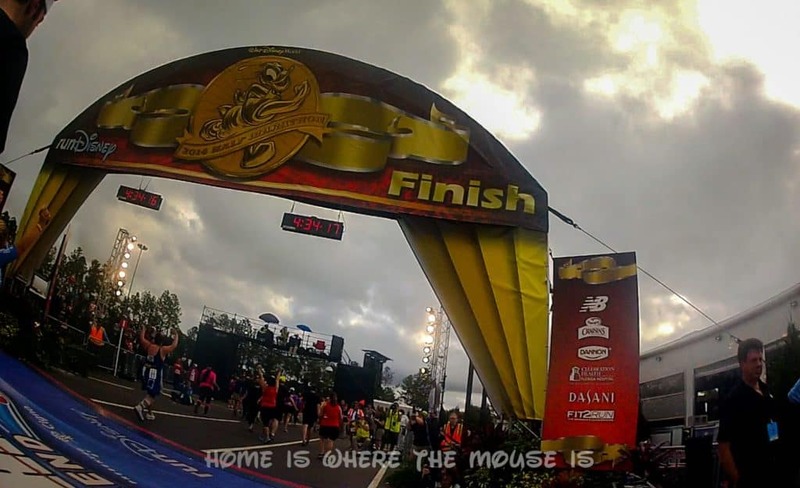 I didn’t even notice Mickey and Donald standing off to the side right before the finish line. Another great photo opportunity missed! I just ran straight through. Every muscle in my legs tightened up as soon as I crossed the finish line, but I didn’t care. It was an awesome feeling. In all the excitement of finishing, I didn’t stop my watch. It kept tracking me while I got my medal, my pictures, my food pack, and my ice! 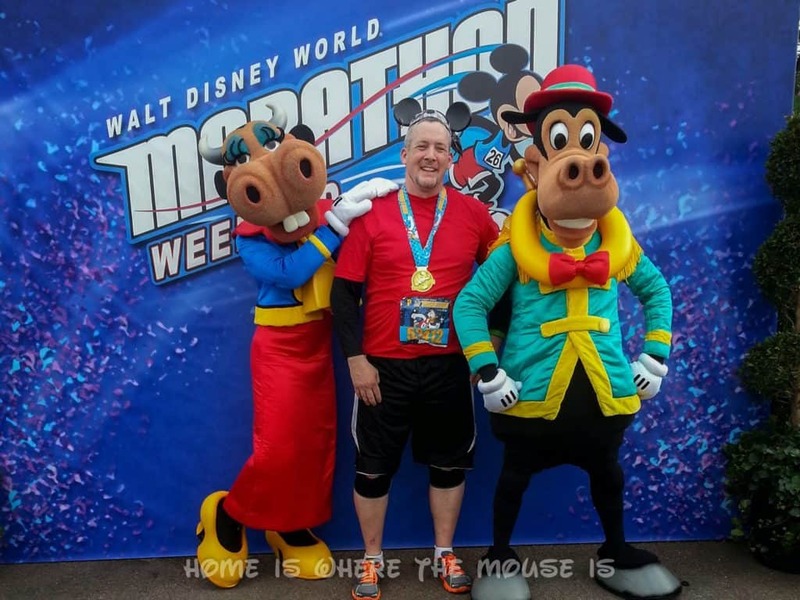 It’s been 7 months since I finished my first half marathon at Walt Disney World. It was an amazing experience, but I plan on using everything I learned from that experience to make the Wine & Dine Half Marathon that much better! 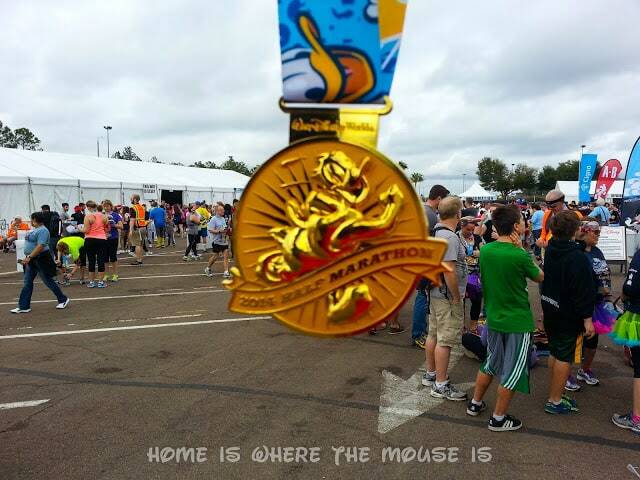 Click HERE to read how the Wine & Dine Half Marathon was a different experience for me! In some ways, I think Lisa is better suited to the task than I am. She doubts herself, but I know that if she approaches our upcoming race the way she does everything else she puts her mind to, she’ll do it. Having her to run with will definitely help rein in any impulsive ideas I get. 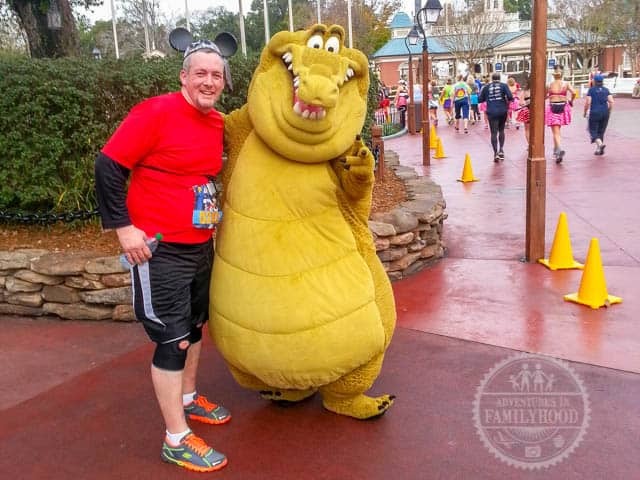 I hope you found my experience to be helpful if you’re thinking about entering a runDisney race of any length. Please bear in mind that I am not an expert by any means. There are plenty of resources online for runners of all levels. For beginners, you may want to check out Jeff Galloway’s training guides and Tara Gidus’ nutrition guides. 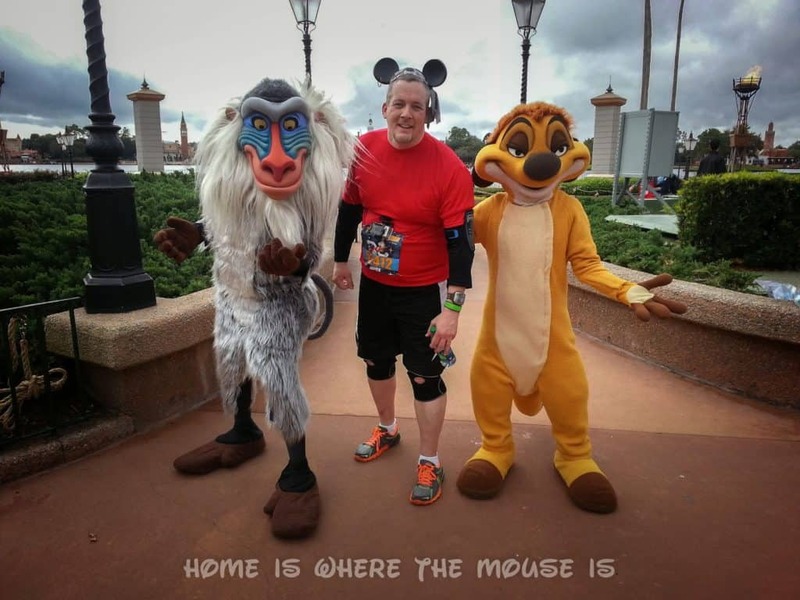 Both are available on the official runDisney website. 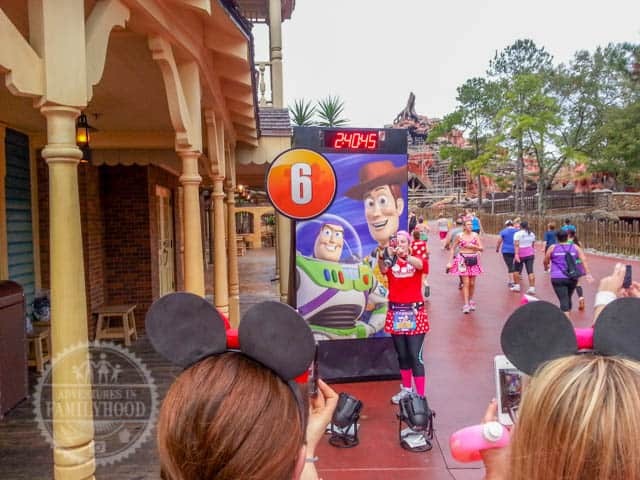 In addition, we’ve put together for tips for first-time runDisney participants that you might find helpful. Have you ever run Disney? Got any tips for aspiring runners? We’d love to hear your thoughts in the comments below! 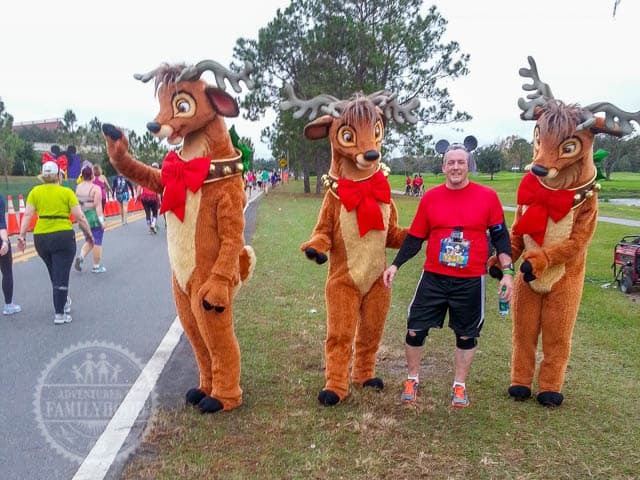 Do you know if they have regular pacers to follow at runDisney races? 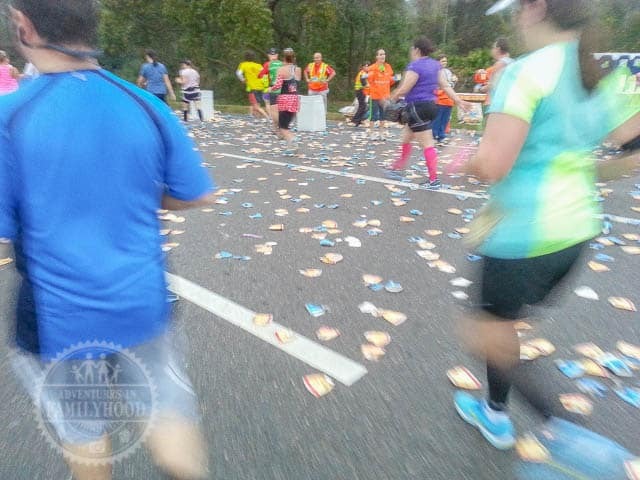 For Marathon Weekend, Clif Bar provided pace leaders, but I never noticed any on the course. Perhaps there weren't any around me since I started so far back? I just checked their site and they don't list the Wine & Dine Half on their race schedule. Only the Disneyland Half is listed right now, so it looks like they don't do all runDisney races. 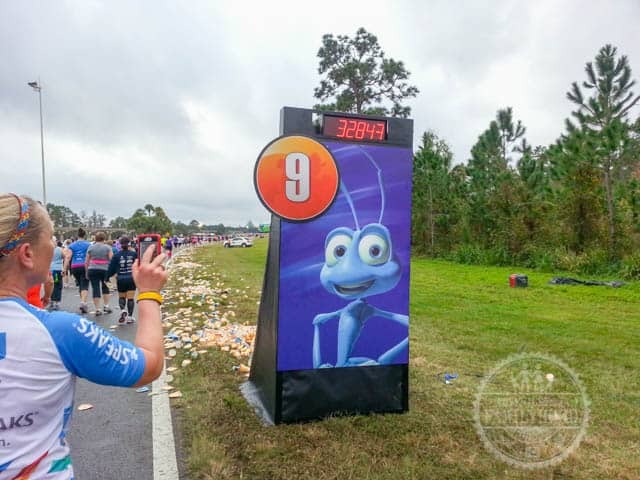 Because of the way runDisney assigns runners to corrals, you'll have to try and get into the same corral as the pace leader you want to run with. What a fabulous post James!!! 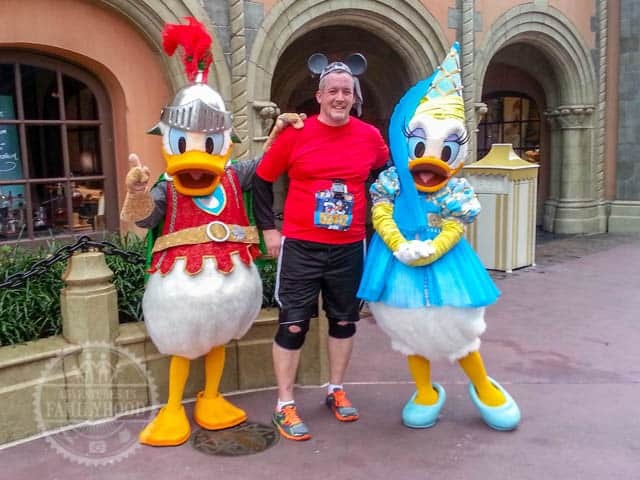 I will be at the Princess Half in February to fun my first runDisney event – it's only the 5K but I am looking forward to that weekend more than ever now. Hope to see you and Lisa there!! Thanks, Donna! 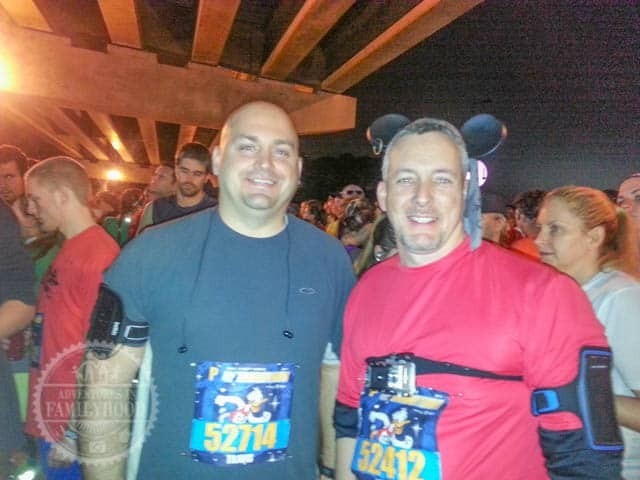 I don't think we'll be making it to the Princess Half weekend next year, but it would be great to do a Disneyland race someday! Good luck on your 5k!! Thank you very much for reading and for taking the time to comment! Good luck with your first half marathon next month, and have a blast completing the coast to coast challenge!! Very envious! I'd love to complete that myself! Thank you for you're awesome post!! Wine & Dine 2014 is my first half Nd I've only officially done a 5k before. I loved reading your honest experience! Thank you so much! Thank you, Tiffany! I hope you have a great time in November!! Thank you, Lauren. What would I do differently? Being able to train on a regular basis is a huge difference for this upcoming race. More training runs has given me a better idea of what my body can handle. I'm also no longer ashamed of taking breaks to walk. Sometimes it's to work out a cramp, but other times it's a planned break that will help me later in the run. The other thing that does is get you more accustomed to running in a large group. It's an entirely different experience to my lonely training runs. It's easy to have a plan in my head, but putting that plan into action during training and seeing how it holds up during actual races is important. As far as touring plans go, you've got MNSSHP before and you've got christmas decorations going up after the W&D. This year, we're just going for that weekend and we're getting to go to the first MVMCP of the season the night before the race! If I had the opportunity to add more days, I'd want to go the week before to get MNSSHP in as well! That would be awesome!! Since the W&D is a night race, I feel I'm naturally better suited for it. Many of my training runs are in the evening, and I'm not a morning person. I'm not going to push it at the parks the day of the race. I'm also going to make sure I'm hydrating on a regular basis the whole time we're there, not just on the day of the race. Thank you for posting this! 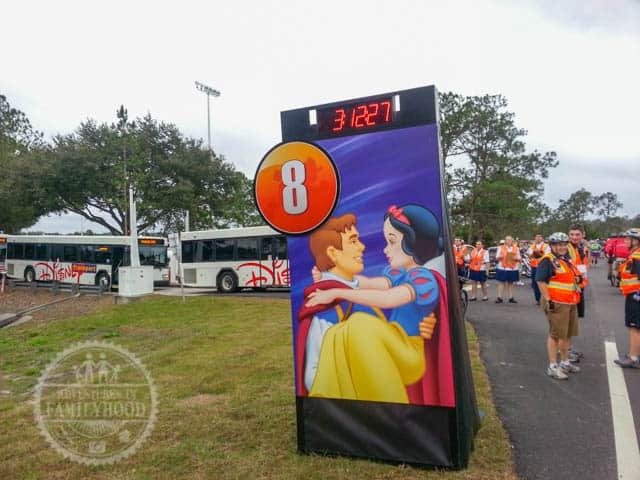 We are running our first half at Disney World's Marathon Weekend in January (a couple months away!!) and this was incredibly helpful. Fantastic advice, encouragement and info!! I'm glad that you found it helpful! Thank you so much for reading and good luck in January!! I'm running my first half in 2 weeks and I'm really nervous that I will get swept up. I haven't been training as much as I should because of school but I've been running this pass week and the next couple of weeks. Do you have any advice? Thank you so much for reading and commenting. I'm so sorry I missed seeing your question until now. I hope you've been able to get some miles these past couple of weeks. My advice for running with less-than-desired training is to take it easy. Definitely use a run/walk approach. 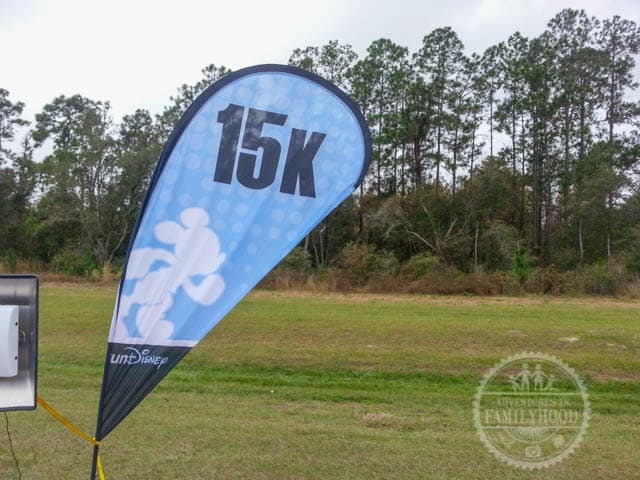 Your goal is to run enough each mile so that you are under the 16:00/mile pace. 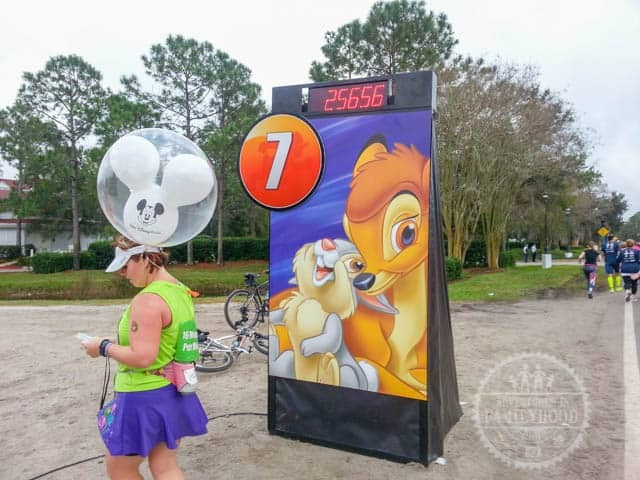 Every mile you complete in less than 16 min is time that you are extending your lead over those lovable but very dreaded balloon ladies. Do not stop for characters unless it's a must-have photo AND you know you have the cushion to stop and the stamina to make up that time. Once you get off World Drive and onto Epcot Center Drive, you should be in the clear from the sweepers. That's around mile 10-11. 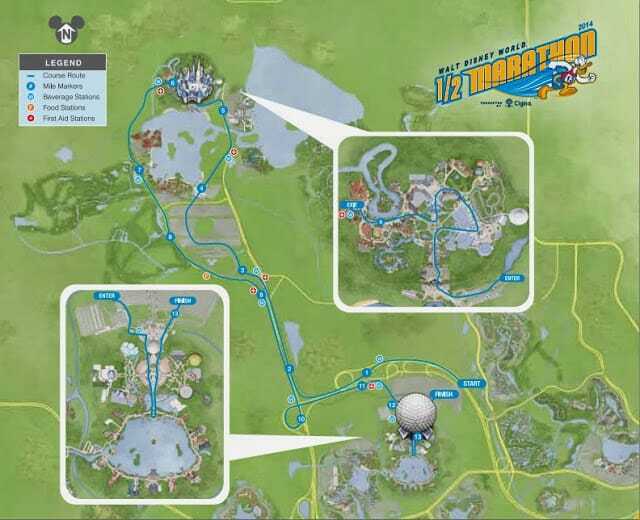 You can walk that final 2 miles through Epcot and back out to the finish if need be. stay hydrated and have a great race!! 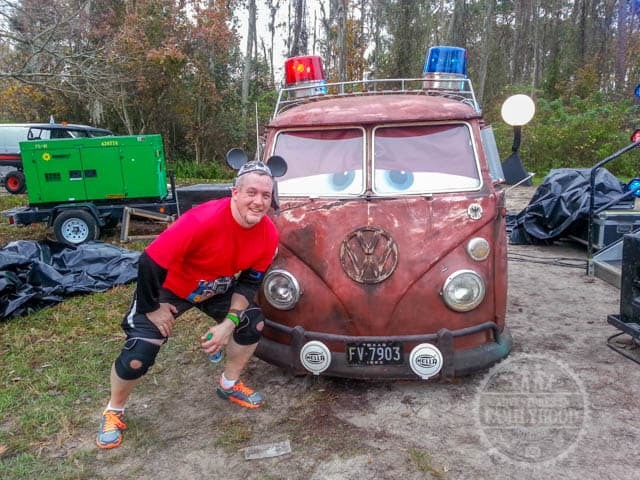 One question: I am focused on running the entire 13.1 (as my training has prepared me for)… Is it worth stopping for characters (which ones?) or will I be tiring myself out waiting in line? How much of an added experience is it to have a picture with a character? Thank you for reading and for sharing! I'm sorry I didn't get to reply sooner. I'm not sure if you'll see this before you hit the starting line for the Half Marathon TOMORROW!! The characters were a huge part of the experience for me. 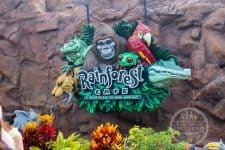 I recently ran my second runDisney Half Marathon and due to the rain there were hardly any characters and it was such a different experience. There are a lot of opportunities, so you don't have to try and get them all. I would definitely try to stop for a few. DEFINITELY get your picture in front of the Castle after you run through and come down the ramp, as that only takes a few seconds to do. For the characters, I can't be sure you'll have the same ones as last year, so I would play it by ear. The lines move quick, but depending on where you are in the pack the lines could still be lengthy. A good rule might be only to stop for the rare outfits and rare characters. You can go into the park later and get pictures with some of them with your medal and it will still be special. But some will only be on the course! Thank you!! I hope you have a great time running in February!! Thanks!! 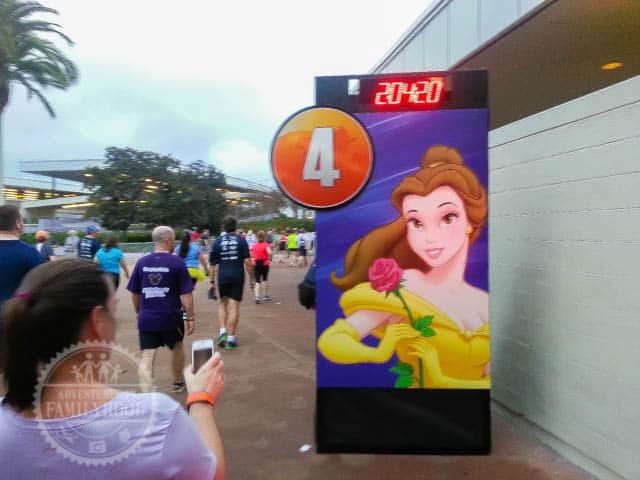 My wife is interested in going for the Princess Half next year, so that may be our next runDisney weekend! Thank you so much! Congrats on getting into the Wine & Dine!! I've been hearing how fast it sold out. We did the Wine & Dine this past year, and it rained the whole race. It was still a great experience, though some of the characters weren't out and the weather made enjoying the after-party impossible for us. 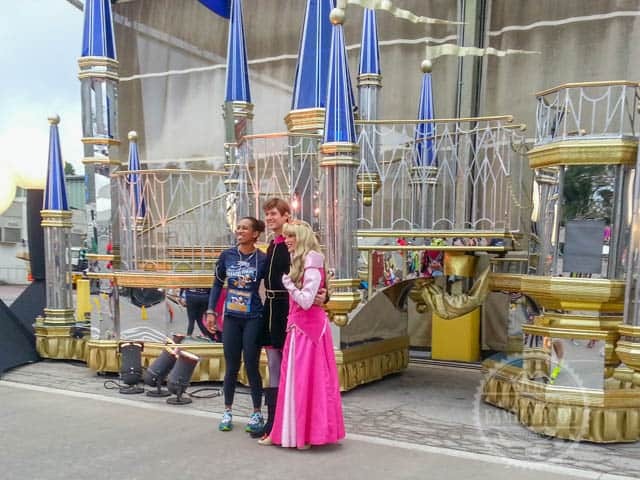 I wouldn't say it is impossible to run your pace or even PR during a runDisney race, but the crowded field can have an impact, even without adding in the temptation of the great photo ops. I think corral placement is huge, and hopefully having some timed races under your belt might help you? If you can start the race with some breathing room between you and the balloon ladies, it will help you relax and run your race. It stinks to be in the back looking over your shoulder. It adds an element of stress that you don't need. Good Luck with your upcoming races!! I really enjoyed your blog. I have to admit, I laughed while reading it. 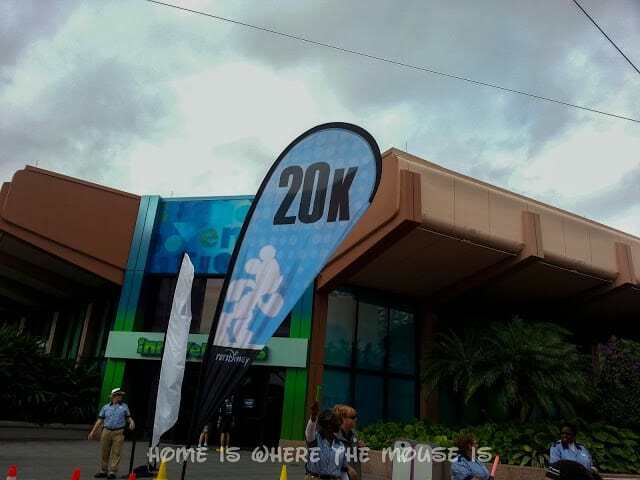 My first Disney run was Tinkerbell 2013(also my very first half). I did the same thing you did. I stopped for every photo op there was and loved it. Then at mile 4 we heard that they were starting to sweep up people and knew that we had to kick it into high gear. I made it to mile 10 before I couldn't do anymore running(all the stopping and starting killed my knee). I ended up finishing but I also learned a BIG lesson. 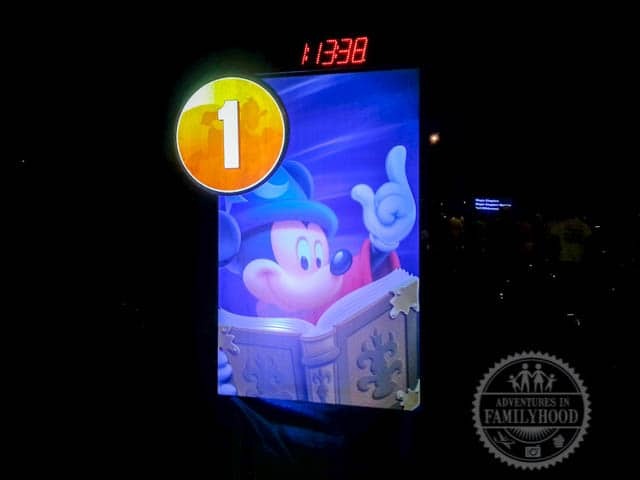 The next Disney run we did was Wine and Dine and we ran the entire thing with only stopping once for a photo op. Thanks, Stacia! I don't mind that you laughed. I'm glad to hear you finished Tink, and improved for the Wine & Dine! That's awesome! 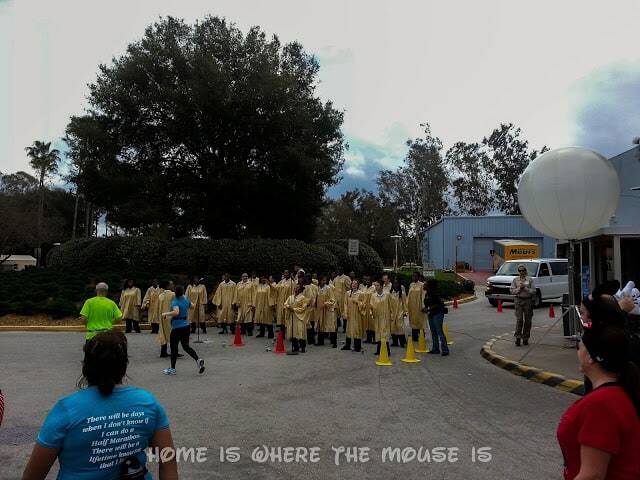 We haven't written about it yet, but during our Wine & Dine race this past November, the balloon ladies actually passed us in DHS!! We were behind them, and mistakenly thought there were no more sweep points since we weren't running on any roads anymore. thankfully, it was out of pride we kept up with them and got in front before the next sweep and were able to finish. 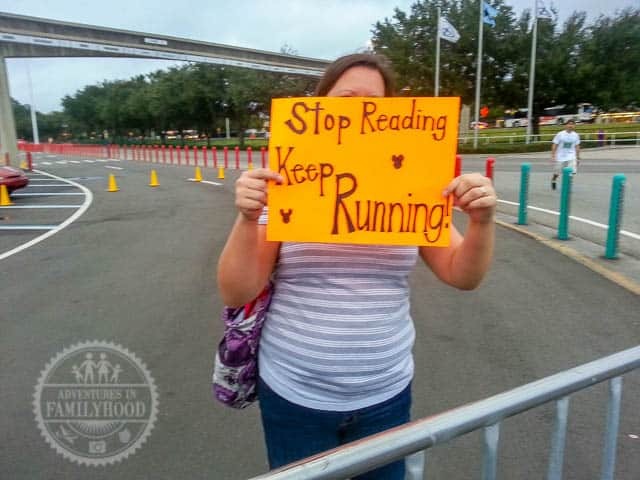 I'm trying to convince Lisa to write that recap from her perspective because it was her first Half Marathon. My mouse ears didn't bug me too much. The strap was a bit annoying around my chin, but moving it to the back of my head fixed that issue. I've heard the headband-style ears can be uncomfortable. I've heard my wife complain about wearing them for too long walking around the park. My suggestion would be to wear them on a training run to see how they work for you. Figure out the best way to wear them that keeps them secure, looks good, and doesn't bother you too much. Good Luck in Disneyland! !